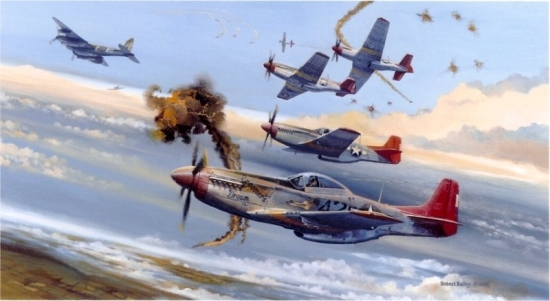 The incredible "TUSKEGEE TRIGGER TIME" depicts Tuskegee P-51 Mustangs of the 301st Fighter Squadron of the famous 332nd Fighter Group fending off a Luftwaffe attack while escorting a RAF photo reconnaissance Mosquito above Germany during early 1945. Featured is one of the most famous Mustangs of the Tuskegee "Creamer's Dream" flown by Captain Charles L. White. Robert Bailey is a master at painting aviation air battle scenes and this is one of his best. 1st Lieutenant Charles A. Hill Jr. Flight Officer Charles A. Lane Jr.